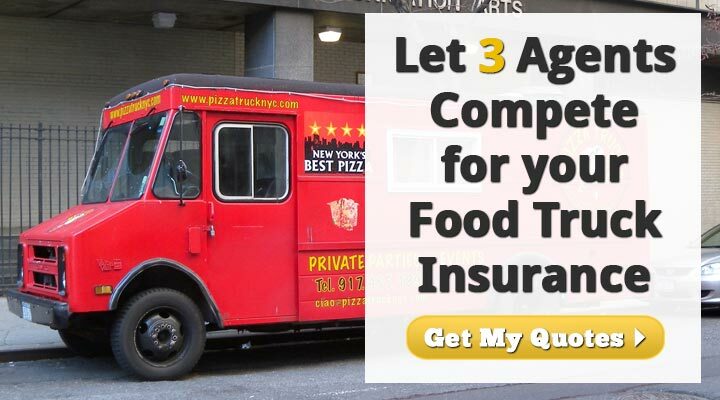 Want to save big on food truck insurance? Get 3 quotes from 3 agents. They compete and you save! One way to reduce the costs of your food truck business is to get a good deal on insurance. That can be hard to do, especially considering how insurance companies are hesitant to reveal their prices. But in order to shop around efficiently you have to know how much food truck insurance costs. Well, the truth is… it depends. The cost of insurance for food trucks is decided by many variables. That said, most policies average somewhere between $2000 and $4000 a year per truck. Where you fall within that range can be determined by a variety of factors, so out of your control, some within it. Your Location – Where you live plays a part in deciding the price of your insurance. Some states are safer to drive in and therefore more affordable. Your Driving Record – Your insurance agent will look at your driving record as he’s determining your price. Fewer accidents means cheaper insurance. Your Truck – The age, make, model, and overall value of your food vehicle will be factored into your cost. Your Food – The way you prepare your food also matters. Industrial Catering Vehicles (ICV), which sell only prepackaged foods, are cheaper to insure than mobile food preparation vehicles (MFPV), which prepare the food as customers wait. Your Equipment – Your agent will also be interested in what cooking equipment you keep in your food truck. Some pieces of equipment are often stolen while others increase the odds of fires. Your Credit – Food truck owners with good credit will often be able to get cheap insurance. Your Area of Operation – How far you drive your food truck or food trailer will play into the actuary tables as well. How to reduce the cost of your food truck ins. There are certain coverages that all food truck venders need to have. Commercial auto liability for the vehicle. Food liability for the restaurant liabilities. Liquor liability if you serve alcohol. All these coverages should be bundled together through a single insurance agent. He’ll often be able to find you discounts if you purchase all your policies through him. One way to lower your premium is to go with high deductibles. This is one of the riskier ways to save money. If you do find yourself in an accident, you could end up paying more in the long run than you would have in your pursuit to save money. Your insurance agent will give you the option of spacing out your payments month to month or paying a large deposit upfront. If you have the means, it’s usually best to pay upfront. This can cut as much as 20% off your overall bill. Far and away the best way to save on food vehicle insurance is to compare several prices at once. We’ve made that part easy. Fill out one form and we’ll connect you with three agents who will then compete for your policy. They compete and you select the winner. Get started now!